A still from the video for Drake's "I'm Upset." 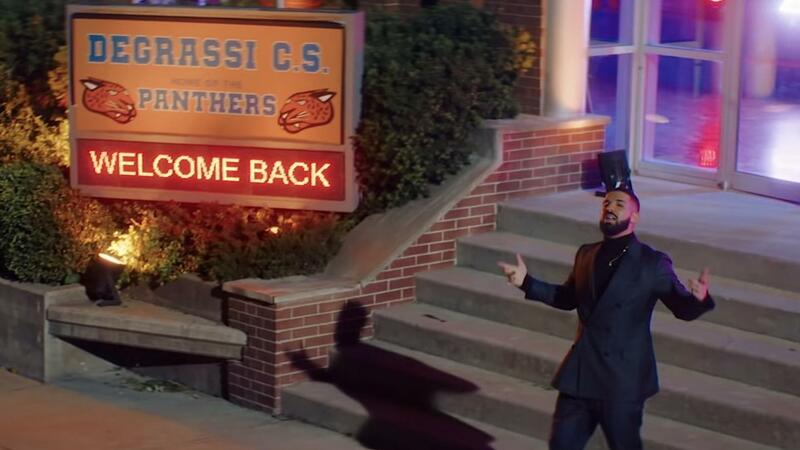 Late Wednesday night, Drake — being Drake — released the video for "I'm Upset," a song that was really just OK until he dressed it up with a long-awaited reunion of the original cast of Degrassi: The Next Generation, the much-beloved Canadian teen drama on which the rapper played Jimmy Brooks from 2001 to 2007, a basketball star whose life changed after being shot and paralyzed (more on this later). This perfectly timed reunion video arrived in tandem with the 6ix God's announcement that Scorpion, his fifth studio album, will be released June 29. In the video, Drake — or is he Jimmy? — wakes up next to a sleeping woman in the middle of the Toronto Raptors home court, clearly late to something. While choosing a suit to wear, we see none other than Jimmy's best friend Gavin "Spinner" Mason (Shane Kippel) join him, before they drive off in a Ferrari to a Degrassi Community School reunion, filmed on location in Toronto. We also see the return of cheerleader Paige (Lauren Collins), goth girl Ellie (Stacey Farber), lovable Marco (Adamo Ruggiero), empowered-yet-insecure Manny (Cassie Steele), troubled musician Craig (Jake Epstein), teen mom and model Mia (Nina Dobrev), Jimmy's ex-girlfriends Hazel (Andrea Lewis) and Ashley (Melissa McIntyre), and even Rick (Ephram Ellis), who shot Jimmy. In one of the most hilarious scenes of the visual, Rick is chased down the halls by Drake's OVO crew. School principal Mr. Simpson — a.k.a. Snake, for those who watched the original Degrassi in the late '80s — buys a strain of marijuana called "The Cr***** Jimmy" from Jay and Silent Bob, the Kevin Smith characters that inexplicably had a story line on season four of The Next Generation, in which they were filming the fictional film Jay and Silent Bob Go Canadian, Eh? None of them have aged a day. Stefanie: Paige and Marco look the same! Sidney: I want Marco's skin regimen. And Liberty's glow up?! It was funny to see which characters were still friends — Jimmy and Spinner, Emma and Manny. Stefanie: I always loved Emma's and Manny's friendship, and I agree about Liberty — I'm glad they didn't keep her as just the teen mom. The lyrics of the song play off of their old relationships in the show; I noticed that when Drake says, "Getting pictures from my ex," it flashes to a shot of Hazel. (She and Jimmy dated for almost three seasons.) And, "Wanna waste half a million / be my guest"? He just did that with this reunion. I'm not upset. Sidney: They kept lots of little character moments like that. I appreciate how Connor got a nice slow-mo moment while walking into the reunion. Yet another impeccable glow up. Stefanie: I did not recognize Connor! Talk about getting hot in college. Let's address Jay and Silent Bob's cameo — my favorite cameo of the video. It was always incredibly cool that Degrassi had a Jay and Silent Bob storyline in season four. Everyone made fun of Degrassi, but they managed to include Jay and Silent Bob's '90s Clerks clout. Dealing to Mr. Simpson, a.k.a. Snake, was a great way to bring them back. "Noice noice noice noice." Sidney: But I think the best cameo of the video goes to Rick. Drake's OVO boys chasing Rick down the hall, looking for revenge for what he did to Jimmy, is genius. Stefanie: I loved that moment, but aside from the hilariousness of it, it felt incredibly bold to bring up a school shooting in a Drake video; at the end of the video when we hear a loud bang, I thought that was were it was headed, instead of a fire. Sidney: Degrassi always took it there: Shootings. Teen pregnancy. Adderall addiction. Eating disorders. Abusive parents. Cyber-bullying. There was a lot going on at that school. Stefanie: Yes, and for a show often stereotyped as part of the after school-special genre, Degrassi did a great job of allowing characters to inhabit other spaces outside of their type. Manny was never just the slutty one, Emma was never just the girl with an eating disorder, Liberty was never just the teen mom, Ellie was never just the girl who self-harmed and Marco was never just the tragic gay character. Sidney: Ahead of its time. Stefanie: Lastly, I was rooting for Craig, and happy to see him stepping out of that car. He went through so much — an abusive parent, a bipolar diagnosis. Craig left the show when he got a record deal and moved to California. I hope he made it. Sidney: But there were some things off about this video, in terms of continuity. First, Rick's cameo was great but, um, Rick died in the struggle for the gun with Sean! You can't go to the reunion if you're dead. Stefanie: Yep, so the "J.T. is dead therefore he can't be here" argument is moot. Drake did say on Instagram that the actor who played J.T. didn't come because he "thought it was a scam." Sidney: That leads us to the biggest discrepancy of the video: Drake's character, Jimmy Brooks, is paralyzed, so how come he didn't roll up in a wheelchair — literally? Does this mean Jimmy learned to walk again? Stefanie: A lot of characters mention the name Jimmy in the video: Jay naming the strain of weed, Snake's "You only live once that's the motto, Jimmy, YOLO." Is Drake supposed to be Jimmy? Sidney: I think we should assume he is Jimmy 'cause every other person there is their character, not the actor. So maybe Jimmy really had the best glow up... He learned to walk again and made it as a rap star. Sidney: Let's move on to how we think this will help or hurt Drake's album rollout. This might be the wildest way I've ever seen anyone swerve a rap beef. Stefanie: Nostalgia is a powerful thing — I know I'm playing into it and I don't care. Sidney: I know. A week ago, I was thinking: "There's no way he's coming back from this Pusha beef." And here we are. This other videos this year, "God's Plan" and "Nice For What," have all been A-1, thanks to director Karena Evans. Plus, this reminds people of his early days of being on Degrassi, which is what he used to get clowned about as a young rapper. Dare I say — is Drake meme-ing himself? This positions him as the underdog in a strange way, which I think will work in his favor for when the album drops. Stefanie: There's a third character here we're forgetting: Aubrey Graham. Back in the Degrassi days, pre-Drake, he was trying to make it as a mixed-race actor in Canada, to not-really-huge success. And though I loved Jimmy, his character wasn't the most complex on the show. But the Drake/Aubrey character is much more complex. Sidney: He kind of played the popular kid in a very linear sense. The shooting is what shook up his character. How do you think this bodes for Scorpion's rollout and the album drop on June 29? Stefanie: Well, nostalgia is a big tool in the arsenal of The Washed. It's a sign that what it's dressing is not as interesting; he just did it so well on this video. But I don't think a lot of people would have cared as much if it was a regular video. Sidney: For sure! In terms of songs, it's not his hottest this year. The video makes the song. Stefanie: I'll say this: Most of all, I loved how happy they all were in the video. They all went through so much. I think that was always the central message of Degrassi on high school and life after it: That it always gets better. Sidney: "Whatever it takes... I know I can make it through!"